When Laura Byrnes – CEO and Head Designer of Pinup Girl Clothing and the Ambassador of Americana aka Charles Phoenix get together for a design collaboration, you know without a doubt it will be out-of-this-world fabulous. There are three dress designs and three men’s shirt designs in the collaboration that you can see here. 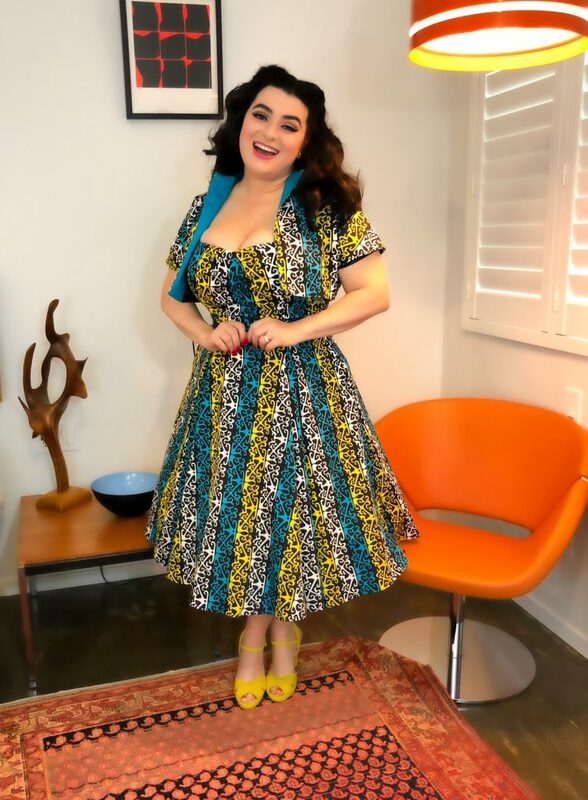 For this post I am featuring the Gloria Swing Dress with Pele Bolero in Calypso Castaway print my husband Gary Greco and I shot for Pinup Girl Clothing. A dress as fabulous as the Gloria Swing Dress in Calypso Castaway calls for an incredible photo shoot location and The Astro Motel really delivered, so keep reading below for a full review of the Gloria Swing Dress and details about The Astro Motel. The first things you notice about the Gloria Swing Dress are bold mid-century modern colors and the print. Deep turquoise blue, bright yellow, and black make for a stunning color combo on this kaleidoscopic print made of luxurious cotton sateen fabric. 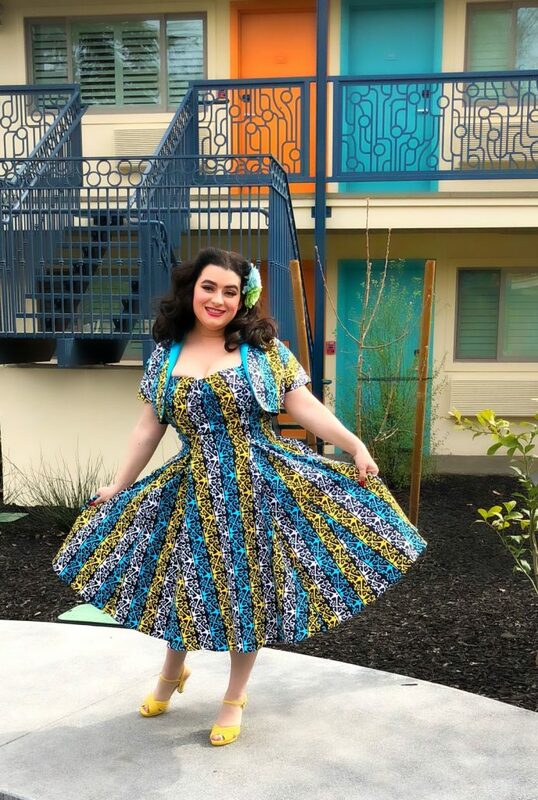 The cut of this dress is designed to flatter a variety of sizes and shapes and hands-down, only Pinup Girl Clothing really knows how to do it and they do it incredibly well. I am wearing the dress in a size 2X and it has such a feminine form. Being a woman with an ample bust I was very pleased with the shape and fit of the dress while nipping in my waist for a stunning hourglass. The straps on the Gloria are wide and adjustable with a slightly dipping neckline so the wearer can show as much décolletage as comfortable with. The swing skirt is very full and feels so luxurious and it also comes with deep pockets. The Gloria Swing Dress in Calypso Castaway comes with a lovely Pele bolero and that’s such a nice addition to a sleeveless dress. The Pele bolero has cap sleeves, contrasting collar detail and is made of the same cotton sateen fabric as the dress. The fabric is so rich and holds its shape and I found the ensemble so comfortable that you can wear it easily day or night. I accessorized with a bright yellow vintage purse, heels, and some hair flowers and felt incredibly beautiful in this gorgeous dress. Also, you can be matchy matchy as this comes in a Men’s Sunliner Shirt in Calypso Castaway print also by Charles Phoenix!! Pinup Girl Clothing makes incredibly well made and designed clothing so you look glamorous and chic with minimal effort; they do all the work for you and you just put it on and go!! The Astro Motel has space age luxury, down to earth prices, and mid-century modern style!! WOW – The Astro Motel was the perfect location for our photo shoot with its incredible attention to detail, style, nostalgia, and Googie flair. 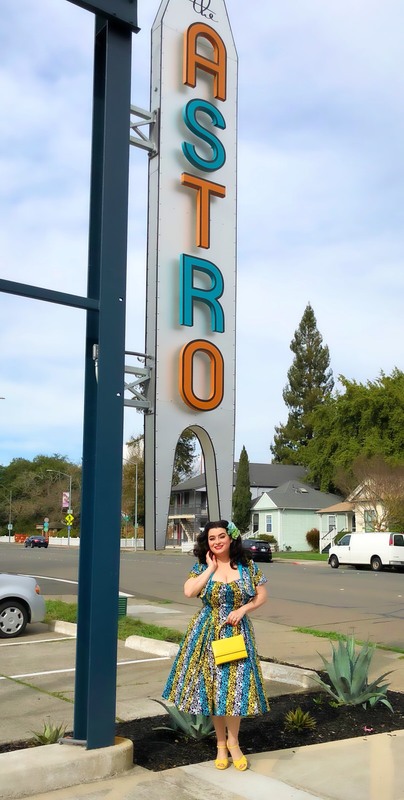 The Astro Motel is located in Santa Rosa, CA, and has recently undergone a tremendous renovation and restoration by the folks behind the well-known wine country Spinster Sisters restaurant. I am finishing up a full post all about The Astro Motel that will be available shortly. For now, these photos will give you a nice glimpse into the fabulous motel.